It’s that time of year again: Banned Books Week, the one week out of the year that we throw a harsh light on those who would try to keep others in darkness. Those who want to project their prejudices and fears onto others. Those who want to hide the books. Last year I wrote about how we should celebrate our right to read. This year I want to talk a bit about how my students are doing just that. I teach sophomore English, and for the past few years, I’ve assigned Fahrenheit 451. I read the book myself when I was a sophomore in high school, and it had a profound effect on me. If you haven’t read it yet, you should. I recommend it to everyone. It’s a scary picture of what might happen if the book banners win, if books are indeed outlawed because of our fear of offending someone. It’s also a reminder that it is up to us to keep literature alive. In Bradbury’s world, books were not initially outlawed. It’s just that people stopped reading. They spent too much time getting offended and not nearly enough time listening. The world is a scary place, and I understand that many parents want to protect their children from it. I get the need to shield children from the ugliness that life sometimes brings. But in doing so, we are also shielding them from its beauty. And while it is the parents’ prerogative to stand between their child and the world, it is not their job to monitor the morals of everyone else. When we ban books, what we are doing is telling those who received comfort from those books that they are wrong. They are wrong to find beauty in something ugly. They should be ashamed of their feelings, their desires, their connection to something others view as sinful or shameful. We teach them to be silent. And when we do this, it is we who are wrong. It is admiral for adults to want to stand between children and the world and become a shield against the darkness. But if I’ve learned anything about the dark, it’s that it creeps around our strongest fortifications, crawls into the gaps, finds a way through the keyhole. Light is the only thing that chases away darkness. Literature is that light to many people. It’s that light to me. It girds readers against ignorance and oppression. It comforts us and shows us we aren’t alone. Above all, it teaches hope. Because in the end, we can’t protect those we love from the world. We can only make sure we’ve helped them to find their strength and to discover that hope. One of the questions I asked my students after they’d read Fahrenheit 451 is which book they would memorize. If, like Montag, they were the one source of survival for a book, which one would they want to save at all costs? In looking at the books some of my students chose to memorize, to keep alive when all others may have been lost, you’ll see that each one holds a mirror up to life and reveals its ugliness, its darkest places. But in the end, each one gives us hope. And hope is the strongest of shields. 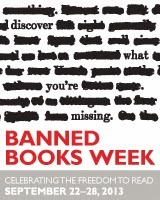 To learn more about Banned Books Week and how you can celebrate your right to read, visit the American LibraryAssociation.